IT band injuries, sore knees, glutes not firing; these are all common injuries that nearly every runner experiences at some point throughout their career. Injuries are definitely not fun. They can start out as small niggles that turn into debilitating pains. Thankfully, though, there are some easy band exercises that will help prevent these injuries. They take up virtually no time at all, and if done a few times a week can make a world of difference. Running is a very linear movement. 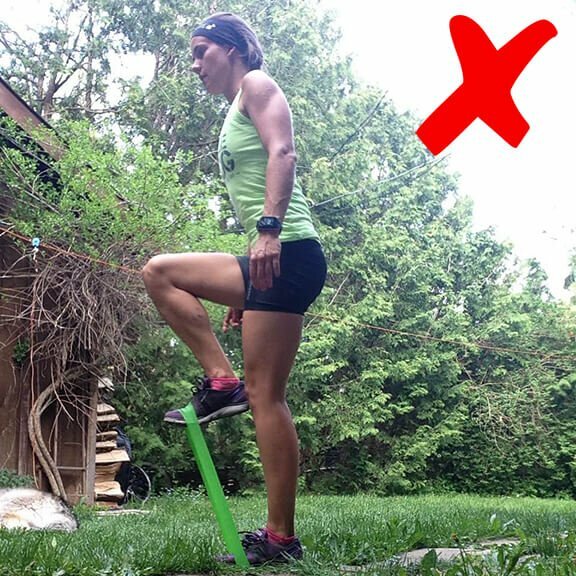 We spend all our time moving forwards, and unless we incorporate them into our cross-training, we never practice the sideways agility movements that will help prevent injury-causing muscle imbalances. My physiotherapist once said to me, “Do you ever wonder why soccer players rarely get injured, but most runners spend a lot of their time fighting off injury?” Both sports involve a ton of running, therefore, a ton of impact. Soccer players, however, practice sudden direction changes while chasing down the ball, and their training regimens involve a ton of agility drills: high-speed footwork, box cone drills, and weaving through ladder rungs. Well, resistance bands are here for us runners to save the day. When you start these exercises, begin with a light resistance band, such as yellow or orange. As you get better at these exercises, graduate yourself to a band with more resistance, such as green or blue. When you become really good, you can even double up on bands, placing one just above your knees and the other around your ankles. Don’t have a resistance band? Not to worry, you can buy them on amazon or at most sports stores. A full set only costs about $20. 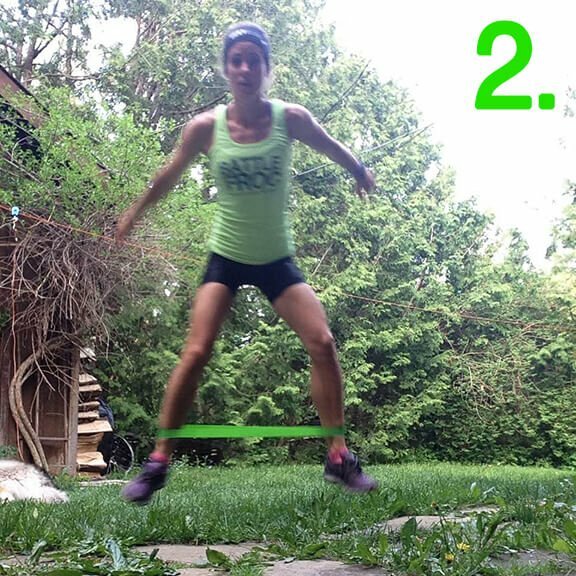 For the first exercise, loop the band around your ankles (see photos below). Start with your feet together, and step laterally (sideways). 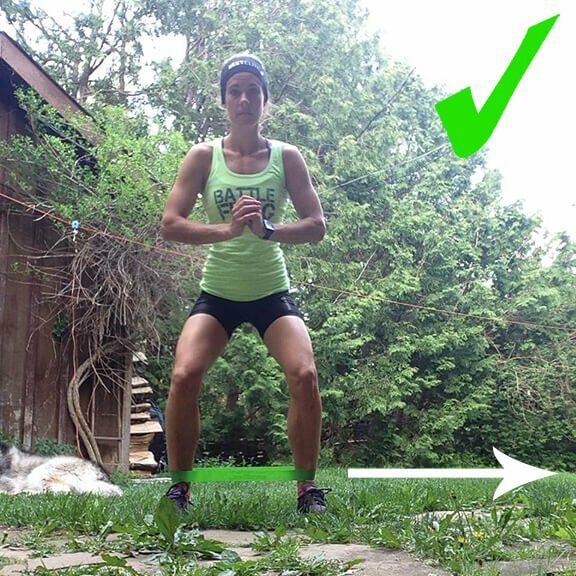 You can either do this exercise standing or in a squatted position. 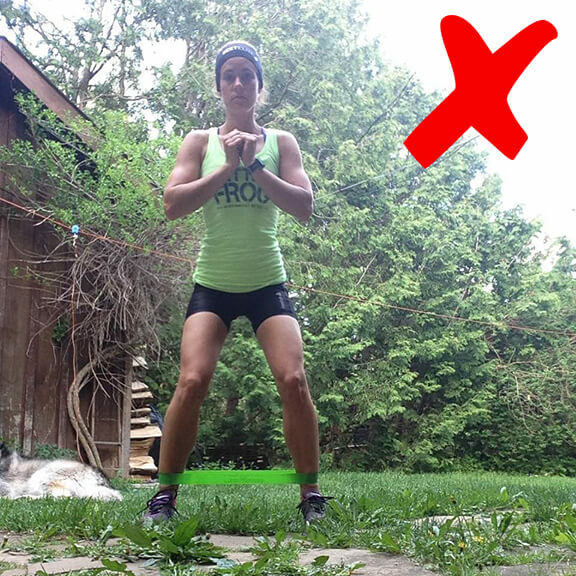 Make sure your knees don’t collapse inwards, such as in the photo below with the X. Work your way up to thirty (that’s right, 30!) steps in one direction, then back the other way. Exercise two: Lateral hops. Keep the band looped around your ankles. Start balanced on one foot, and hop sideways to the other foot, spreading your feet as far apart in the air as you can. 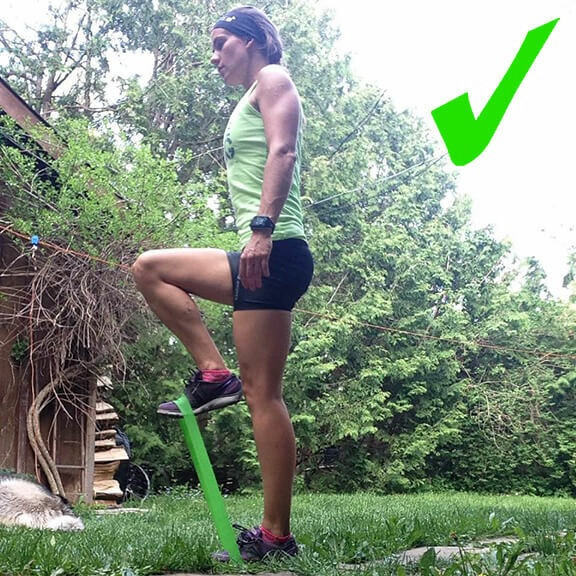 This exercise works not only your glutes, but also all your balance muscles, so it’s important to stick the landing for at least two second on each foot before jumping back the other way. Now for the third and final exercise! Vertical knee raises with the band looped around the arches of your feet. You want to drive one foot up quickly, until your knee is at a 90-degree angle. Again, work your way up to thirty on each leg. Make sure to engage your core, and don’t let your trunk collapse inwards when you drive your knee up, as demonstrated in the photo with the X. 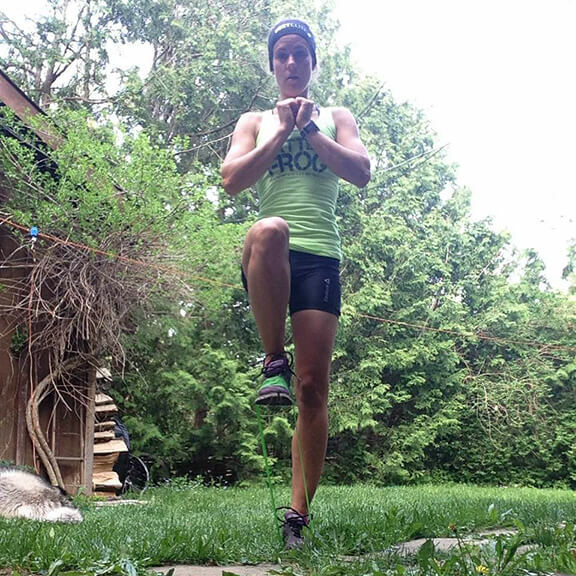 This exercise will help to strengthen your hips and hip flexors, some of the muscles we use most in running! These exercises only take a total of about two minutes to complete, and can be done daily. They’ll help prevent muscle imbalances, collapsing hips when running, keep your glutes firing on both hills and flats and your hip flexors from slacking off. With strong hips, hip flexors, and glutes firing on all cylinders, your body will thank you when your running reaches a whole new level! 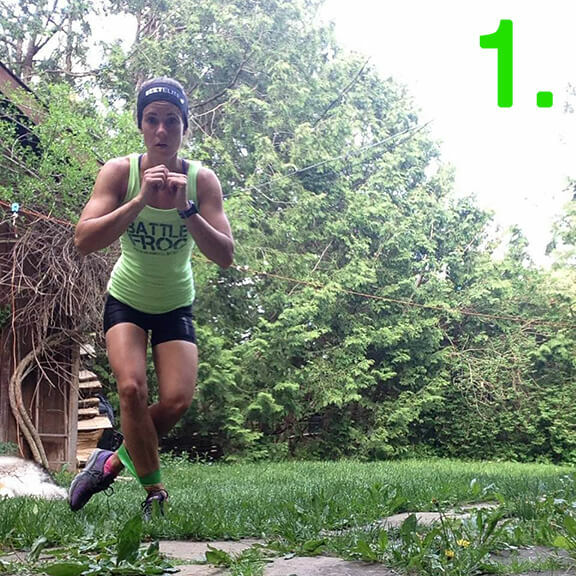 Lindsay Webster, Competitive OCR, Mountain biker, xc skiier & runner. Lindsay is a pioneer in the female OCR world, and her own life. She left the stability of a regular income to take a chance on something she wasn’t even sure she would be good at. The result? She’s the happiest she’s ever been.